This is the final part in a series of blog posts to highlight the work of our Teaching & Learning Innovations team. Each team member was asked to write a post about the work of one of their colleagues. Hollywood depicts superheroes as larger than life super-humans endowed with special powers enabling them to leap tall buildings, dodge speeding bullets, and ultimately save planet Earth from certain doom. Exciting? Yes! Entertaining? Perhaps. Believable? Likely not. However, here at CSUCI, Wonder Woman truly does exist. 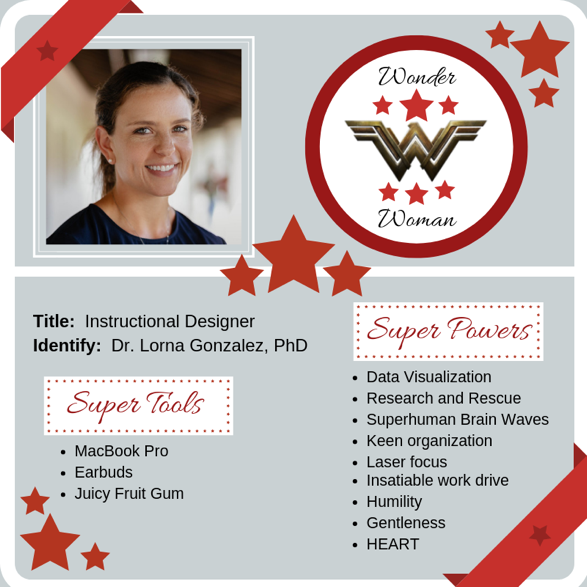 No not, Diana Prince, but a real life Wonder Woman, Dr. Lorna Gonzalez, the newest Teaching and Learning Innovations (TLI) Team Member, School of Education Lecturer, and Instructional Designer for CODEL. In all seriousness, Lorna, to our team at TLI, is an authentic Wonder Woman. Lorna’s career in education began with seven years in K-12 Education teaching English Language Arts and eventually as an Academic Technology Specialist. As a doctoral student at UCSB while continuing to work in K-12, Lorna taught first-year writing composition and worked as an Instructional Design consultant. In 2013, Lorna shared her talents with CSUCI, teaching as a lecturer, both face-to-face and online for the School of Education, while continuing to teach and pursue her doctorate at UCSB. In addition to her professional roles and doctoral studies, Lorna and her husband welcomed the arrival of two sons, now ages 2 and 6. Faster than a speeding Brain Wave! This past December, as a wife, mother, lecturer and instructional designer, Lorna traded in the role of doctoral student for doctor of philosophy, defending her dissertation, Aspects of a Literacy of Infographics: Results from an Empirical-Qualitative Study, and completing with no revisions! Yes! Wonder Woman in the flesh! In August 2018, we stole her away from UCSB and Lorna joined TLI full-time as the Instructional Designer for CODEL, an online doctoral program shared between CSUCI and Fresno State. With the prominence of online education and the unique demands of teaching in a digital space, instructional design has emerged as a professional field in both corporate and educational sectors. More than teaching and technical support, an instructional designer, as Lorna has defined it is, “Part-muse, part-project manager, part-designer, part-instructor, and part-action-researcher, an [Instructional] Designer designs high-quality learning experiences for students and faculty alike–experiences informed by learning theory, relevant research, and proven practices.” Instructional Designers play multiple roles in support of faculty including coach, researcher, sounding wall, instructional technologist, graphic designer, and the list goes on. 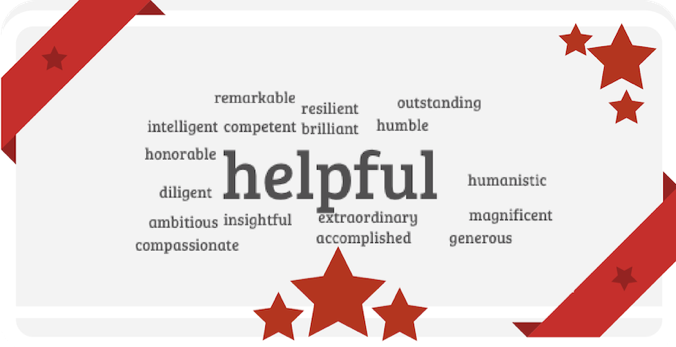 Clearly, Lorna’s vast skill-set makes her an invaluable asset to the program’s and students’ success. Lorna’s drive and dedication are unparalleled. At any one time, Lorna is supporting at minimum of six instructors at various stages of course development and facilitation. In addition to faculty support, Lorna is also responsible for managing the annual Qualifying Exam, facilitated fully online. Most recently, she ideated, planned and facilitated faculty presentations of best practices at the annual CODEL Faculty Convening, providing a conference-like atmosphere in which peers engaged with peers. Additionally, working with Kristi O’Neil-Gonzalez, Lorna surveyed CODEL Students, innovatively leveraging survey results to engage faculty in discussions around course accessibility and student needs. In her spare time, she manages to locate and share current research and tools pertaining to teaching and learning, authors blogs for Teaching and Learning Innovations, submit peer reviews for journals, and consult for the CSUCI Course Review Team. No wonder she has to start her day at 4:00 AM! Undoubtedly brilliant, innovative, and resilient, Lorna is undeniably one of the most humble, kind, and compassionate people you will have the pleasure to meet. She is an incredibly gifted professional, integral team member, and a caring friend. In preparing to write this post, I asked those that know Lorna to sum up their thoughts by submitting ‘one’ word that best described Lorna. The image that materialized is no surprise. Hollywood prefers flash and dash, but it’s educators like Lorna, that make it possible for so many to thrive! If you haven’t had the pleasure of meeting Lorna, you should stop by the FIT Studio; however, you may have to wait your turn to work with the real Wonder Woman! Knowing that Lorna will respond in the same manner as notes in the article regarding her “heroic heart.” As a software engineer and now cloud solutions architect with over 40 years in private industry I, her father, couldn’t be any prouder of her achievements and accomplishments over the years in both education and in her chosen technical career. I have asked her to describe her role at CSUCI and she responded as stated in the article, and even in her home life, it is also true. I had described her as “Superwoman” in the past, but “Wonder Woman” is an even better description.